Kate (DeDe Drake) and Abby (Lidya Korotko) are a lesbian couple arguing about their relationship while driving through the desert. Abby is upset that Kate doesn't share her level of commitment, and by the time the couple reaches their destination more or less in the middle of nowhere, she's ready to break up. Just one last bit of business to handle: the two have been paid to dispose of a body. Once it's buried, though, that's it. Only problem is, the body isn't quite as dead as it was supposed to be. Ethan (Brandon Bales) pleads for his life while the women try to figure out what to do. Burying a corpse is one thing, but they aren't killers. While struggling to escape, Ethan gets his hands on a flare gun and fires it. Despite this, he seems on the verge of convincing the women to let him go when a truckload of nearby rednecks show up, alerted by the flare. They leer suggestively at the ladies like they stepped out of central casting for rapey hick stereotypes, but appear to be more bark than bite. Then one of the rednecks makes a comment that strikes a nerve with Ethan and the situation escalates into violence. The overall tone here is decidedly post-Tarantino, the two female leads with their back and forth banter seemingly inspired by Jules and Vincent from PULP FICTION. It feels like an exercise or a demo reel more than a story writer/director Scott Brown just had to tell, but it does show what he's capable of. On a technical level, that's quite a lot, as the guy definitely has the filmmaking chops. 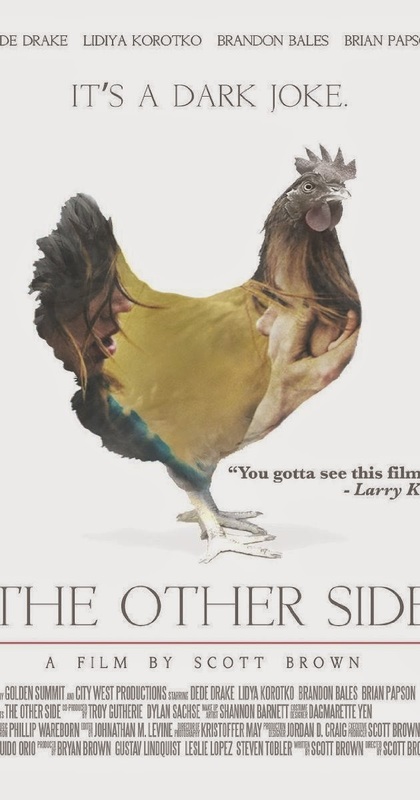 Taken at face value, “The Other Side” is reasonably entertaining if a bit contrived. Its attempt at some sort of deeper emotional resonance comes off a bit forced, but there are plenty worse ways to kill 20 minutes. Based on this, I'd say not only does Brown have what it takes to take a stab at a feature film, I'd also be happy to check it out. Hopefully he dials down the Tarantino influence and finds more of his own voice, but even if he doesn't my guess is he could deliver a solid B genre film. 2 ½ out of 4 stars.